This basic macronutrient, responsible for rebuilding and repairing muscle tissue (among other things), has become the Holy Grail of nutrition in many people’s eyes. In their minds, more protein equals a healthier product. This rise of protein has created a greater demand for high-protein products, so companies are churning them out as fast as they can print the labels. Since we’re always interested in what’s hot in the food world, we’ve compiled the nine weirdest high-protein products currently available for purchase. The human body is roughly 60 percent water, and water plays a crucial role in almost every important bodily function. Water transports nutrients and oxygen, supports proper muscle contraction, improves joint function and fights fatigue. But you know what water doesn’t have? Protein. A company called Protein2O has changed that. Their line of naturally flavored waters contain 15 grams of protein per serving. I give it a decade before gyms start installing pools filled with high-protein water. Just open your mouth while you’re swimming laps and you’ll be jacked in no time. Chips are more closely associated with couch potatoes than gym rats, but high-protein chips have become a bonafide craze. Meant to serve as a snack for fitness-minded folks, they come in a wide variety of flavors, including BBQ, Sour Cream & Onion and Salt & Vinegar. We actually reviewed ProTings high-protein chips a couple years ago, and they weren’t half bad—though they did contain some questionable ingredients. A cookie might be the last place you’d turn to for protein, but several companies have begun producing high-protein cookies in recent years. One brand is Lenny & Larry’s, whose varieties include chocolate chip, birthday cake, white chocolate macadamia and pumpkin spice. Each one of their cookies contains 16 grams of protein—but also around 30 grams of sugar. No wonder people seem to love them. Pasta is a staple food for many Americans, and most standard pasta varieties contain a few grams of protein per serving. However, companies have seen an opportunity to jack up the protein content and create “high-protein pasta” products. Barilla, the world’s leading pasta maker, has gotten in on the action with their “Protein Plus” line, which contain 17 grams of protein per serving. Have you ever been eating a Starbust and thought to yourself, “man, I really wish these had more protein”? No? Well, despite your indifference, high-protein candy is totally a thing. BPI Sports produces a line of “FUNNBAR” products, which are essentially gummy candy with a protein punch. One serving contains 15 grams of protein, and varieties include Grape, Tropical Berry and Citrus Blast. Pizza might be the most popular food in the world, and most standard varieties pack a good amount of protein. For example, one slice of Domino’s cheese pizza contains 12 grams of protein. However, some companies have decided that’s not enough. For example, Golden Home sells an “Ultra Thin Protein Pizza Crust” that serves up 16 grams of protein. High-protein cereal has become a big thing in recent years, as many big name brands, such as Special K and Fiber One, have rolled out offerings. Cheerios got in on the game with their Cheerios Protein product, which has come under fire for barely being higher in protein than traditional Cheerios. We at STACK have never been big fan of energy drinks, but millions of people drink them every day. Thus, some companies that produce these beverages saw an opportunity to capitalize on the high-protein craze. Monster Energy recently introduced their “Muscle Monster” energy shakes, with 13 grams of protein per serving, to go along with 9 grams of added sugar. This is it, the product that inspired this entire article. High-protein freaking beer. 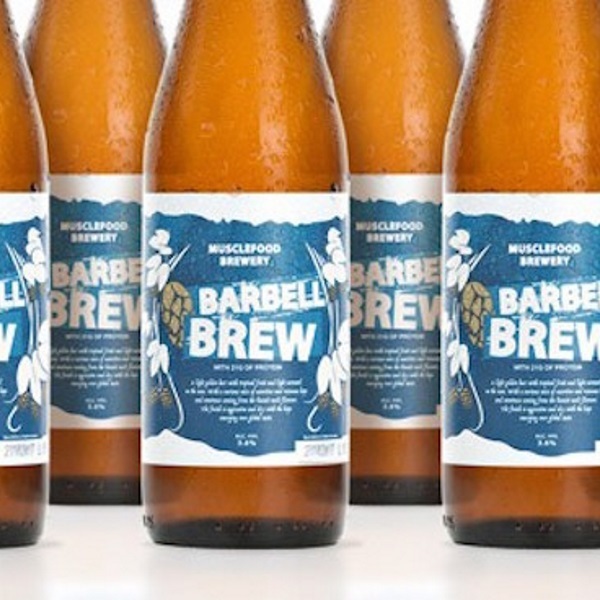 Seemingly spawned by a bro’s in-between-sets brainstorm, Barbell Brew contains 21.8 grams of protein per serving. Its ABV is relatively low at 3.6-percent, and it’s fairly light in calories at 92.4. Beer isn’t exactly a great post-workout choice compared to things like chocolate milk, but you could do a lot worse than Barbell Brew if you’re of legal age and going to have a cold one after the gym. It’s fun to read about these wacky products, but the truth is you don’t need them. Protein is found in many foods, including lean meats, dairy products, legumes, nuts, eggs, fish, whole grains and beans. The average American has absolutely no problem getting enough protein. In fact, recent FDA guidelines state that teenage boys and men generally consume too much protein. The long-term effects of consuming too much protein need further study, but current findings include a potential increased risk of cancer and bone loss. Protein is important, but like anything else, too much of it can be a bad thing. If you’re eating a balanced diet, odds are you’re already getting enough protein. If you crunch the numbers and learn that you’re coming up short on your daily totals, try adding more whole grains, beans, nuts and legumes—not high-protein beer, chips and candy.